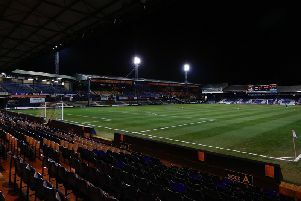 Luton Town conceded three times in just 14 second-half minutes to throw away a 3-1 lead and lose 4-3 to Carlisle United at Kenilworth Road this evening. It had looked like the hosts were going to move into the play-off places with a comfortable victory once Danny Green’s delectable volley opened up a two-goal advantage with just over half an hour to play. Ole’s were ringing around the stadium which had been deathly quiet even with Hatters in the ascendancy, as home fans saw Luton string together a move of 15-20 passes move as they had finally climbed into the play-off place and all was right with the world. But in the blink of an eye that was gone as Cumbrians boss Keith Curle brought on Jabo Ibehre and Alex Gilliead. The two subs combined to superb effect as Carlisle ripped open Luton’s ponderous defence with ease as Gilliead (66), Ibehre (79) and Derek Asamoah (80) left home supporters both angry and quite frankly stunned that the three points had slipped through their grasp. The hosts were forced into two changes from Saturday’s goalless draw at Stevenage as Paul Benson was suspended and Luke Wilkinson ruled out with a thigh strain. That meant Jack Marriott came into partner Josh McQuoid upfront, with Mark O’Brien alongside Scott Cuthbert at the back. Hatters had the perfect start to the game on five minutes Olly Lee fed the ball into Marriott who cleverly turned his man before arrowing his shot beyond Mark Gillespie and into the far corner. Town looked for a second with McQuoid heading Green’s corner over, while the winger then showed signs of Luton’s shoot on sight policy, ignoring McQuoid’s run to shoot narrowly over. Carlisle managed to keep the deficit to one and showed their own attacking intentions, an unmarked Jason Kennedy forcing Tyler to parry smartly. The hosts then dropped their upbeat tempo badly, with Michael Raynes hooking over and Danny Grainger heading wide from close range. Tyler was by far the more over-worked keeper by now as first, the Town stopper missed his punch with the loose ball fired wide, while on the half hour, Mark Ellis lofted a very presentable chance over. Luton’s opportunities were mainly from range, Smith sending an ungainly volley wide and Lee over the top, while Marriott did break into the area, swivelling to shoot at Gillespie, before scuffing another attempt wide. There was no doubting Carlisle deserved an equaliser though and it arrived on the stroke of half time though as a long ball wasn’t dealt with and Charlie Wyke reacted quickest to easily beat Tyler. As they had in the first period, Luton then made a glorious start to the second, Lee switching play to the right and Green’s marvellous delivery headed home by McQuoid. Hatters were starting to get Green on the ball with more regularity as United picked up two bookings trying to stop him, the second from Hery giving Town a free kick they took full advantage of. Green’s first effort was charged down but the rebound came back to him and he took a touch before unleashing a superb volley into the far corner. However, Luton’s defending, which without Wilkinson had flattered to deceive all evening, started to completely collapse, with sub Gilliead firing past Tyler with his first touch. Ibehre thought he had made it 3-3, turning in after Tyler could only parry Grainger’s fierce blast, but was flagged offside. However, the experienced striker wasn’t to be denied for long, left woefully unmarked in the box to volley home Gilliead’s cross. In a flash, Carlisle then had the lead, Asamoah allowed to run at a shell-shocked defence and slotting low beyond Tyler, stunning Kenilworth Road. With that, Luton’s heads dropped as, bar a long range free kick from Green that Gillespie parried behind, they never looked like levelling. Hatters boss John Still now needs to somehow lift his players’ morale off the floor ahead of a trip to an improving Newport County this weekend. Hatters: Mark Tyler, Alex Lawless, Scott Griffiths, Scott Cuthbert (C), Mark O’Brien, Danny Green, Jonathan Smith, Olly Lee, Cameron McGeehan (Paddy McCourt 81), Jack Marriott (Craig Mackail-Smith 70), Josh McQuoid. Subs not used: Elliot Justham, Sean Long, Curtley Williams, Ryan Hall, Nathan Doyle. United: Mark Gillespie, Tom Miller (Jabo Ibehre 64), Danny Grainger (C), Luke Joyce, Michael Raynes, David Atkinson, Jason Kennedy, Charlie Wyke (Anthony Sweeney 85) Bastien Hery (Alex Gilliead 63), Derek Asamoah, Mark Elllis. Subs not used: Dan Hanford, Gary Dicker, Joe Thompson, Alexander McQueen. Booked: Grainger 53, Hery 56, Green 67.